Lakeshore Drive, head west on Center Street, turn right on Lakeshore Drive. 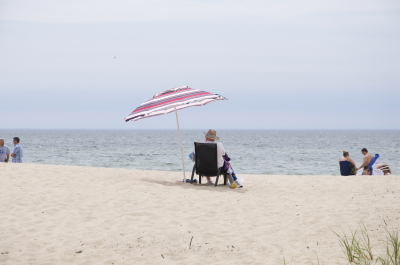 Find a Bed & Breakfast near the beach in Douglas or nearby Saugatuck. Vehicle entrance fee. 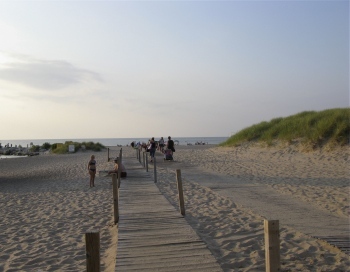 Walk to the beach through West Side Park, which has restrooms, picnic tables, playground, grills, baseball diamond. Stairway access to beach. I-196 exit 30, SW on Blue Star Highway, then drive north one mile on 70th to 116th Street. Parking available for only one car. Beach access via a steep path down a bluff. No facilities. Makeshift parking. Lake access only via short, flat sandy path. No facilities. A recent lawsuit prohibits use to lake access only. Canoes and kayaks can easily be carried to the beach. 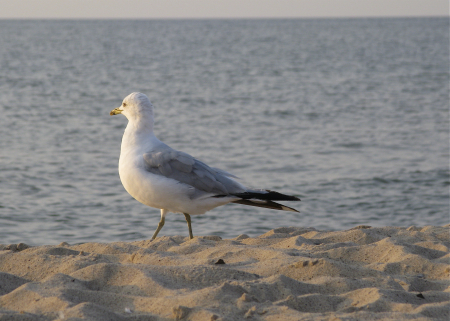 Find a Bed & Breakfast near the beach in nearby Saugatuck or Douglas. Check out conditions on the Kalamazoo River with the Saugatuck webcam at the Butler Restaurant. 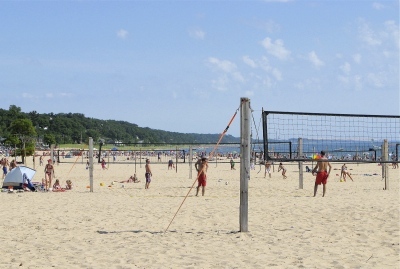 Parking fee, restrooms, food, limited number of picnic tables and grills, showers, sand dunes, playground, walk along the beach to the 550-foot pier and view the pierhead lights and boat traffic entering and leaving the Kalamazoo River. Favorite local spot for sunset watching. 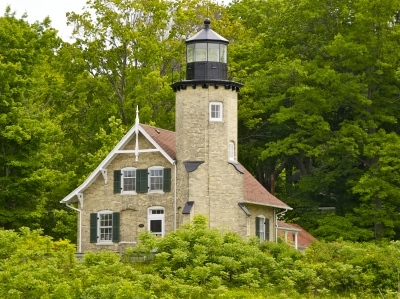 Adjacent to the 173-acre Saugatuck Harbor Natural Area with 3650 feet of additional Lake Michigan shoreline. 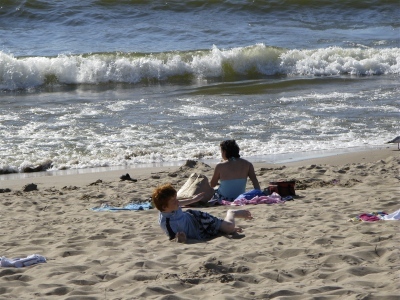 Find a Bed & Breakfast near the beach in Saugatuck or Douglas. 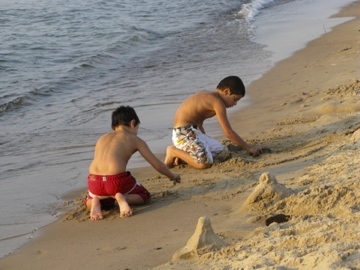 Find a Bed & Breakfast near the beach in nearby St. Joseph. I-94 to Exit 16. Take Red Arrow Highway north to first traffic light (Lake Street). Turn left on Lake Street and continue to Weko Beach. I-196 to exit 7, Hagar Shore Road west 0.2 miles to the end of the road, then turn south (left) on M-63 and drive 1.5 miles. From I-196 Exit 7, take Hagar Shore Rd West to end (.2 mi). Turn right (North) onto M-63/Blue Star Hwy (.5 mi). I-94 to Exit 6 Union Pier. Union Pier Road west to stoplight. Turn right on Red Arrow Highway, drive for 1 mile. Find a Bed & Breakfast near the beach in Lakeside or nearby Union Pier or New Buffalo. Find a Bed & Breakfast near the beach in New Buffalo. Check out current conditions at the beach with the St. Joe Lighthouse webcam or the Silver Beach webcam. No entrance fee, playground, picnic pavilion, BBQ, beach access via the John & Dede Howard Recreation Trail. Parking fee, restrooms, food, picnic area, access to North Pier lights, sidewalk access to beach, pavilion, changing rooms. Stroll out 1800 feet on the North Pier to see the lights. Find a Bed & Breakfast near the beach in St. Joseph. No entrance fee, parking, restrooms, picnic area, observation decks on bluff, erosion prevents access to beach. Parking fee, restrooms located ½ mile away at North Lake Park, picnic area, fishing. Find a Bed & Breakfast near the beach in Union Pier or nearby Lakeside or New Buffalo. Parking fee, Lake Michigan and Duck Lake shoreline; 728 acre day-use park, restrooms, picnic tables, hiking, fishing, sand dunes. 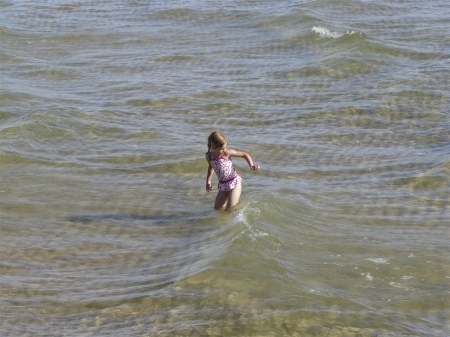 to see current conditions on Lake Michigan and the White Lake Channel. Bear left at the end of Murray Road and follow signs to the White River Light Station Museum. Free parking in the museum lot. 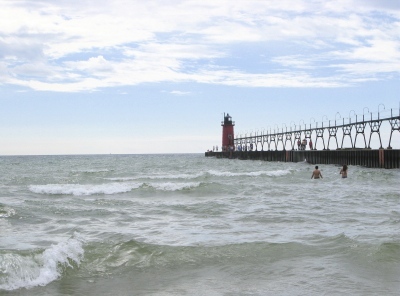 Walk along the channel to the beach on Lake Michigan or stroll out on the pier. 150 ft of Lake Michigan shoreline, no lifeguard (swim at own risk) or facilities on the beach, though there is a bathroom available at the museum. Day use only. Fishing allowed off the pier and the channel walkway. Take W. Old Channel Trail to Lau Road then bear right at the fork onto Lifeguard Road. On the White Lake channel into Lake Michigan across from the White Lake Light Station Museum. Free parking, 600 ft of Lake Michigan shoreline, small picnic area, park benches on the channel, restrooms (no running water), no lifeguard (swim at own risk), day use only (6am-11pm). Fishing allowed off the pier and the channel walkway. Entry fee, 88 acres of rolling dunes, large sandy beach, restrooms, playgrounds, food, picnic shelter, 67 campground sites, rental cottage, views of Lake Michigan & Little Flower Creek. Wheelchair accessible viewing platform. 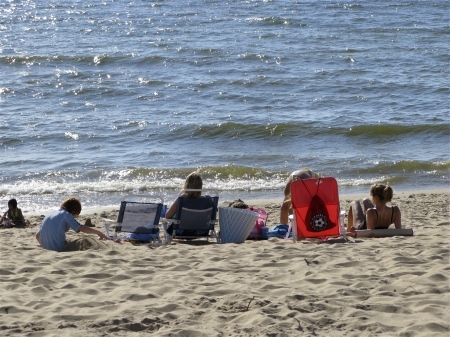 Find a Bed & Breakfast near the beach in the Montague - Whitehall - White Lake area. 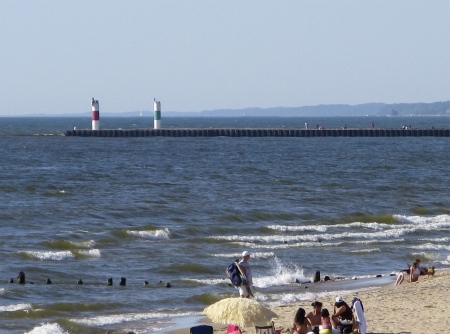 Check out current conditions at the beach with the Muskegon Lighthouse webcams. 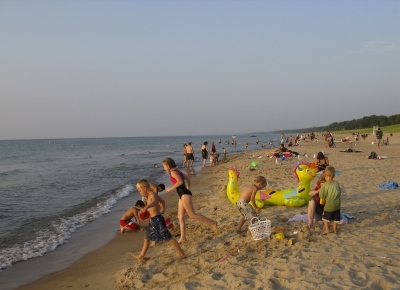 Free parking, restrooms, picnic shelters, beach and dunes accessible by ramp, playground, basketball court, nature trails, 1 mile of Lake Michigan shoreline, dog beach located at the northern part of the park. Narrow beaches and high, steep dunes in a natural state - no power or restrooms. Beach Street walkway connects with other beach parks in the area (Pere Marquette and Kruse). Entry fee, parking; 1165 acres including Lake Michigan and Muskegon Lake, restrooms, picnic tables, campground, hiking, fishing, boat launch, ice fishing, metal detecting area, lighted cross-country ski trails. No entry fee, city park, restrooms, playground, restaurant and bar, volleyball, access to lighthouse and channel, handicapped walkway to beach. 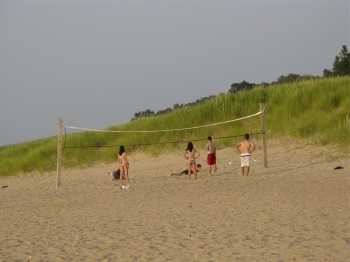 Entry fee, 145 acre park, 2000 feet of white sandy beach, 213 campsites, playground, lodge, picnic tables, volleyball, tennis, baseball, basketball, horseshoe pit. Close to Michigan Adventure amusement park, approx. 1 mile north of Muskegon State Park. 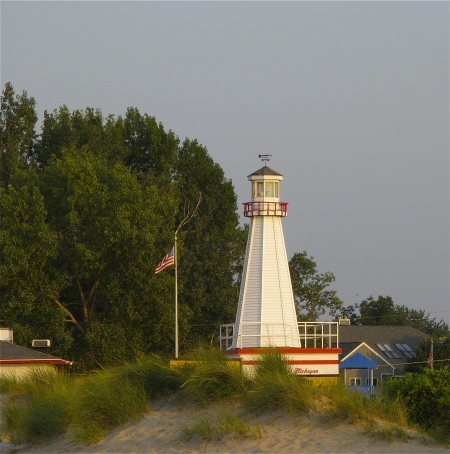 Find a Bed & Breakfast near the beach in Muskegon. 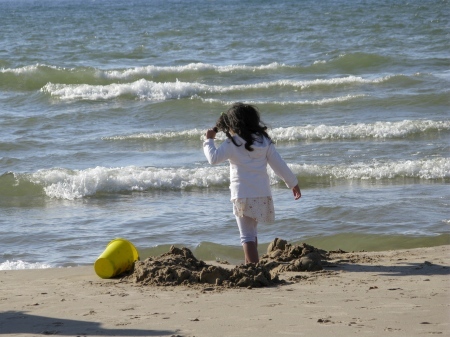 Day use park (5am-10pm), 189 acre city park, 4000 feet of Lake Michigan shoreline. No lifeguards, swim at own risk. Picnic area overlooking the Mona Lake channel with tables, grills, shelter and restrooms. Scenic deck overlooking the channel. 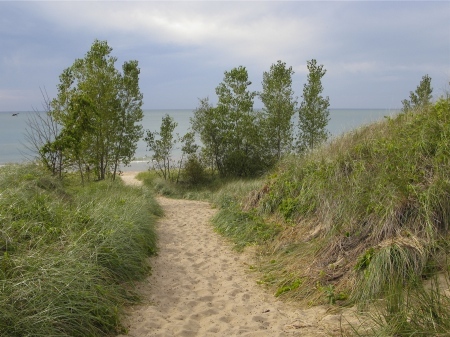 Parking fee, 1100 acres of forested dunes, 3 miles of Lake Michigan shoreline; Gillette Visitor Center, restrooms, picnic areas, hiking trails, campground. 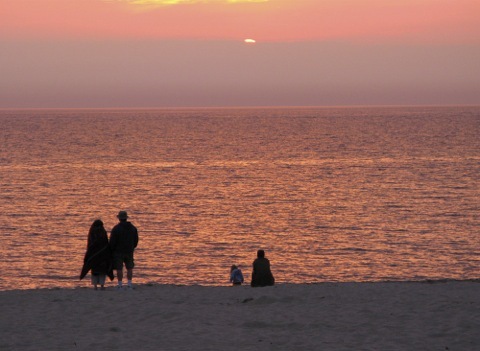 Find a Bed & Breakfast near the beach in nearby Muskegon. Parking fee, 7 acre park, restrooms, vending machines, playground, picnic tables, grills, volleyball, beach walk accessible by wheelchair, deck overlooking the dune, shelters. 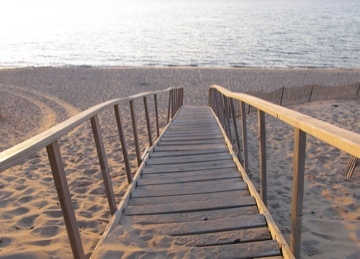 Find a Bed & Breakfast near the beach in nearby Grand Haven. Check out conditions on Lake Michigan and at the beach with the Grand Haven Steelheaders webcam or the SurfGrandHaven webcam. Parking lot, other facilities available at nearby State Park. Parking fee, playground, concession stand, beachhouse, restrooms, picnic area, pure sand beach, campground, lighthouse, fishing off lighthouse pier or breakwater. Take Harbor Trolley bus from downtown to avoid parking difficulties during high season. Parking fee, 164 acre park, parking lot restrooms, pit toilets near beach, picnic tables, grills, shade canopy near beach, hiking trails to Lake Michigan, dune boardwalk trail. Access to beach via stairway and high wooded dune system may be strenuous. However some trails are wheelchair accessible. 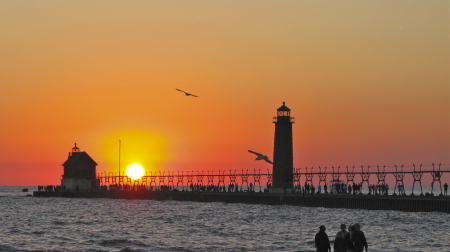 Find a Bed & Breakfast near the beach in Grand Haven. 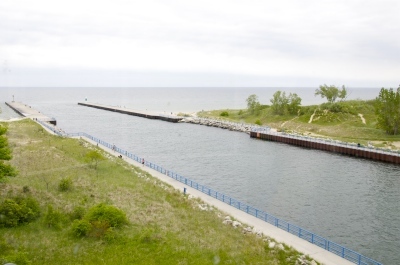 Check out conditions on Lake Michigan and the Holland channel with the Spyglass Condos webcam or Lake Macatawa with the Boatwerks Restaurant webcam. Parking fee, food, showers, restrooms, picnic tables, fishing off pier. 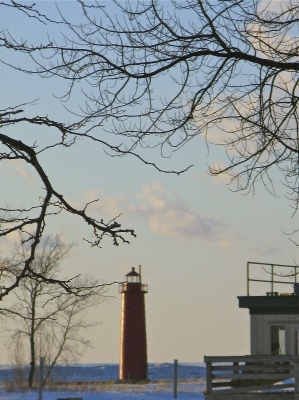 Walk along the boardwalk on the north side of the Black River channel for views of Holland's iconic "Big Red" Lighthouse, the most photographed lighthouse in Michigan. Stroll over 1000 feet to the end of the arrowhead breakwater pier for views of the beach, the pierhead lights, and boats entering and leaving the harbor. Very popular spot for sunset watching. Limited free parking, access to beach via long stairway. 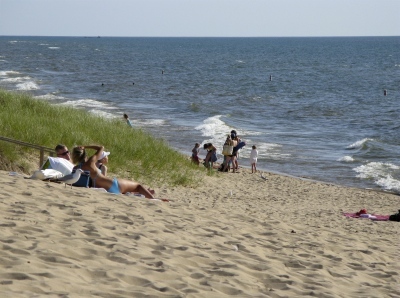 Find a Bed & Breakfast near the beach in Holland or nearby Saugatuck. I-196 to Exit 13 (Covert). Turn left at the bottom of ramp and cross under the interstate. Pass through the first stop sign and continue straight ahead until you reach Covert Park. Parking, $6 day pass, picnic tables, grills, pavilion, bathhouse, outdoor shower, walk through woods to reach 1/4 mile beachfront. 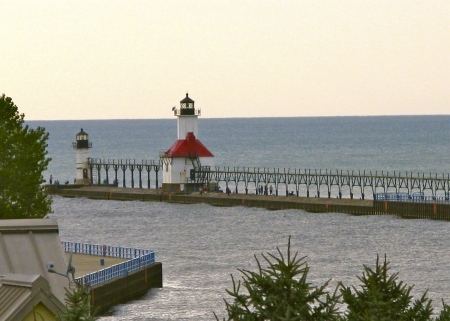 Find a Bed & Breakfast near the beach in nearby South Haven. Check out current conditions at the beach with the South Haven Lighthouse webcams. Parking fee, restrooms, food, fishing from pier, volleyball. Stroll on the 850-foot pier to the pierhead light at the end and watch the boat traffic coming in and out of the river. The red lighthouse is right across the channel on the south pier. Take Phoenix Street through downtown South Haven. Will end at Water Street and the beach. Parking fee, sidewalk access to beach, food, playground, picnic tables, restrooms, fishing, skateboard park. Stroll on the 850-foot pier to the picturesque red lighthouse at the end and watch the boat traffic coming in and out of the river. 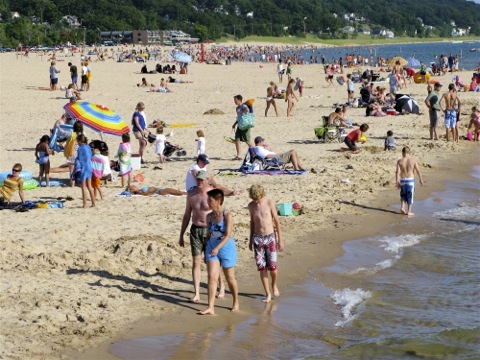 South Haven’s most popular beach. I-196 exit 18, north on M-140 for 1/10th mile, then drive west on 14th Avenue for 7/10th of a mile, then south on Blue Star Highway for 1.4 miles. Turn at Ruggles Road entrance to Van Buren State Park. Find a Bed & Breakfast near the beach in South Haven.